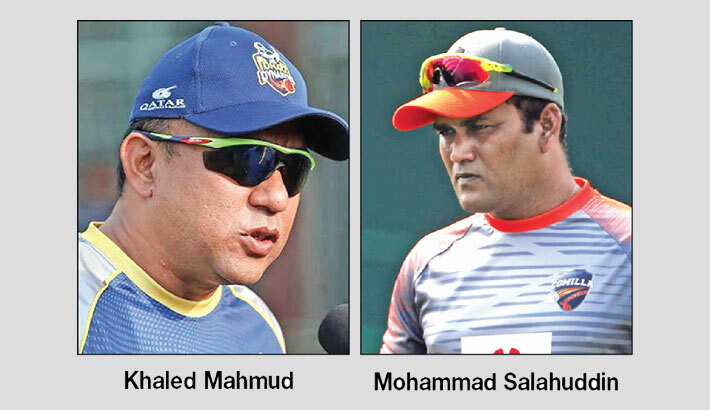 Since Dhaka Dynamites reached Bangladesh Premier League (BPL) final against Comilla Victorians country’s social media witnessed a raging storm regarding the rivalry of the two head coaches- Khaled Mahmud and Mohammad Salahuddin. The face to face encounter of the two local coaches in the final took the center stage of discussion considering their rivalry at different juncture of their careers. It reached such a stage that their rivalry was considered parallel to the battle between Pep Guardiolla and Jose Mourinho during their stint with Manchester City and Manchester United in English Premier League. Sujon and Salahuddin’s careers had reached the peak as both have tasted BPL trophy in their stint as coach so far while it was more note worthy considering they had ousted five foreign coaches- Mahela Jayawardene, Tom Moody, Lance Klussner, Simon Helmut and Waqar Younis at different phase of the tournament to book their berth in the final. Their achievements cannot be undermined considering the fact foreign cricket coaches are often considered to be the ultimate solution to every problem of the dressing room in the country just like other franchises believed it to be though the investment looked to have gone in vain. The duo with their cricket knowledge and experience outsmarted their opponents with ease and comfort to reach so far but that hardly ends the story rather it seemed to be the beginning of an intense rivalry to stamp their authority in country’s cricketing landscape by winning the trophy. It was nothing short of a shock on Salahuddin’s face when he was asked in the official pre- final press conference whether he believes that a rivalry is brewing up between him and Sujon just like the battle between Pep and Jose. “I don’t think it that way,” said Salahuddin after taking a pause for a minute at the academy premises to digest it before quickly taking a decision on how to handle it sensibly on Thursday. “I hope it will be fruitful for the local coaches. Local coaches have found it difficult to land stints in the tournament. Even the jobs for assistant local coaches were also reducing. Since we (two local coaches) made to the final, franchises might think differently in the future,” he said. “They will be more inclined to give us (local coaches) opportunities. If we do well, it will really be good for the other local coaches as well. I always love to see local coaches getting more assignments and learn from the foreign coaches,” he added. “Khaled Mahmud is an experienced coach and there is no use for a comparison between us as I believe he is far ahead of me,” he said. His counterpart Sujon also echoed the same sentiment when asked the same question and stated that rather than thinking about their rivalry they should be happy that local coaches are proving their worth in BPL. “I don’t think we will be playing the matches rather we will be helping cricketers from our respective camps,” said Mahmud. “Despite foreign coaches in most of the teams, two local coaches made it to the final. This can be considered as an achievement and I am happy for that,” he said. “Salahuddin is an experienced coach and I have all the respect for him and wish him good luck,” he concluded.